The final concert of the season for the Las Vegas Master Singers is 4 pm Sun May 20 with “A Festival of New Composers” featuring the Las Vegas premiere of “Mass for a New Millennium” by Richard Nance. This final show celebrates the 14th season for the group directd by Dr. Jocelyn K. Jensen. Tickets are $15/$10 seniors, military, students. Purchase at UNLV Box Office or call 702-895-2787. 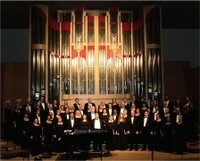 For more info see website lvmastersingers.com. Doc Rando Recital Hall UNLV Campus Las Vegas NV.